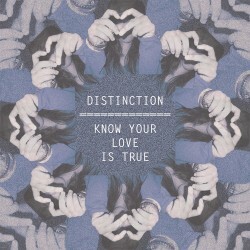 Distinction – "Know Your Love Is True"
It's been a hot minute since we heard from UK producer Distinction, and the Leeds native has not been sat around doing nothing for the past six months. In fact, he has been hard at work creating a deluge of vibes and sounds for his upcoming mixtape RVST. After ending 2012 and starting this year with some really dope refix's of hip hop and R&B tracks, most notably was his take on Danny Brown's "Grown Up", Distinction worked with fellow UK native Janset on her single "The Truth". Finally though, he is back with some brand new original material for our ears, with "Know Your Love Is True", a bass drenched anthem that has both depth and character, making it a sure fire dance floor smash. The track features a vocal hook that is pitched down, making it sound almost sinister, on top of a deep bass line and some trap like drums that really bang. One of my favourite parts of the track comes halfway through, where Distinction perfectly chops up the hook, creating a completely different vibe. "Know Your Love Is True" serves as a reminder to us all that Distinction hasn't completely disappeared from our radar. In fact, it's quite the opposite. It appears that very soon we will be able to listen to the fruits of his labour when RVST eventually drops, until then you can stream/download "Know Your Love Is True" below and also hit up his Soundcloud to see what all the fuss is about. "Know Your Love Is True"